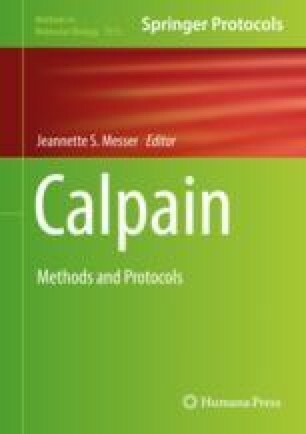 Calpain, an intracellular Ca2+-dependent cysteine protease, is known to play a role in a wide range of metabolic pathways through limited proteolysis of its substrates. However, only a limited number of these substrates are currently known, with the exact mechanism of substrate recognition and cleavage by calpain still largely unknown. Current sequencing technologies have made it possible to compile large amounts of cleavage data and brought greater understanding of the underlying protein interactions. However, the practical impossibility of exhaustively retrieving substrate sequences through experimentation alone has created the need for efficient computational prediction methods. Such methods must be able to quickly mark substrate candidates and putative cleavage sites for further analysis. While many methods exist for both calpain and other types of proteolytic actions, the expected reliability of these methods depends heavily on the type and complexity of proteolytic action, as well as the availability of well-labeled experimental datasets, which both vary greatly across enzyme families. This chapter introduces CalCleaveMKL: a tool for calpain cleavage prediction based on multiple kernel learning, an extension to the classic support vector machine framework that is able to train complex models based on rich, heterogeneous feature sets, leading to significantly improved prediction quality. Along with its improved accuracy, the method used by CalCleaveMKL provided numerous insights on the respective importance of sequence-related features, such as solvent accessibility and secondary structure. It notably demonstrated there existed significant specificity differences across calpain subtypes, despite previous assumption to the contrary. An online implementation of this prediction tool is available at http://calpain.org. The authors would like to thank Prof. H. Sorimachi of the Department of Advanced Science for Biomolecules at Tokyo Metropolitan Institute of Medical Science, for providing many insights on the biological aspects of calpain proteolysis and providing us with the crystallography view of calpain–calpastatin docking illustrating this chapter.